Australia's orchid flora is highly diverse, with approximately 80% of the world's terrestrial species and very high endemism. However, orchids are highly susceptible to environmental change and many species are threatened. A complex set of factors is thought to be contributing to declines in orchid populations, including past and present habitat destruction, small population sizes, florivory, altered fire regimes and pollination deficits. Within this context, climate change has emerged as a key threat that is causing the timing of orchid flowering to shift but also has the potential to change habitat suitability for orchids and to disrupt interactions with the pollinator communities that orchids rely on for reproduction. 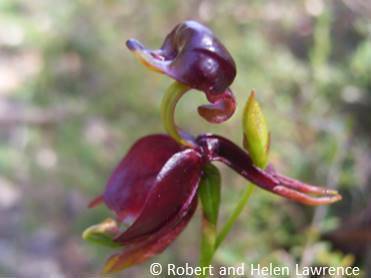 Wild Orchid Watch (WOW) is a recently funded national citizen science program to monitor Australian native orchids and their habitats. It is a partnership between the University of Adelaide and native orchid enthusiasts across the country. We will develop a new phone app that can be used by researchers and the public alike to submit photos of orchids and habitat information to a central database for identification and interpretation. WOW is the first national observatory for all wild orchids and their habitats. WOW will provide information on orchid populations across many species and regions, and act an early warning system for ecological change. WOW is working in partnership with the Terrestrial Ecosystem Research Network (TERN) facility node at the University of Adelaide, which manages a field-based ecosystem surveillance monitoring program operating across the country. We are offering a PhD top-up scholarship of $7,000 per annum for three years for an enthusiastic student to undertake research on orchids in a changing climate, associated with WOW and a high impact research group at the University of Adelaide. Applicants holding, or intending to apply for a scholarship such as a Research Training Program Stipend (RTPS) or equivalent are eligible. In addition, operational costs will be covered. The project is hosted by the University of Adelaide in the School of Biological Sciences and our team is based at the Waite Campus. The successful applicant will undertake hands-on monitoring of orchid populations and their pollinators and habitats using the WOW app as well as more detailed survey techniques, and will have the opportunity to work with community groups and interpret data collected from the app. To take on this project, you will need to hold or be eligible for a base PhD scholarship, have a relevant undergraduate degree, good communication and teamwork skills and be keen to take on internal training in ecological monitoring and analysis. Your job will be easier if you have existing experience in GIS, field ecology or statistical analysis. Experience in first aid or off-road driving would also be viewed favourably. For further details of the project, selection criteria and how to apply contact Greg Guerin (greg.guerin@adelaide.edu.au), Ben Sparrow (ben.sparrow@adelaide.edu.au), or Andy Lowe (andrew.lowe@adelaide.edu.au).